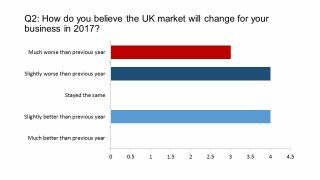 UK pharma leaders aren’t overly optimistic about 2017 – the deteriorating state of NHS finances and its impact on drug spending and, of course, Brexit being the main culprits. Set against this gloom, pharmaphorum’s UK pharmaceutical leaders survey shows that a new generation of medicines and their ability to advance patient care will sustain momentum in the sector in 2017. For many, 2016 was a year they were happy to bid good riddance to on 31 December. From the deaths of many beloved and iconic entertainers, to repeated terrorist atrocities, war crimes in Syria, and victories for Brexit and Donald Trump fuelled by ‘post truth’ politics, 2016 really seemed like the end of the world as we knew it. Of course these events – particularly Donald Trump and Brexit – set us up for even more tumultuous times in 2017 and beyond. However, these are indeed the ‘best of times’ as well as ‘the worst of times’, when one reflects on ongoing gains in global health, and the promise of new medicines, devices and digital technology to help the world live longer, healthier lives. 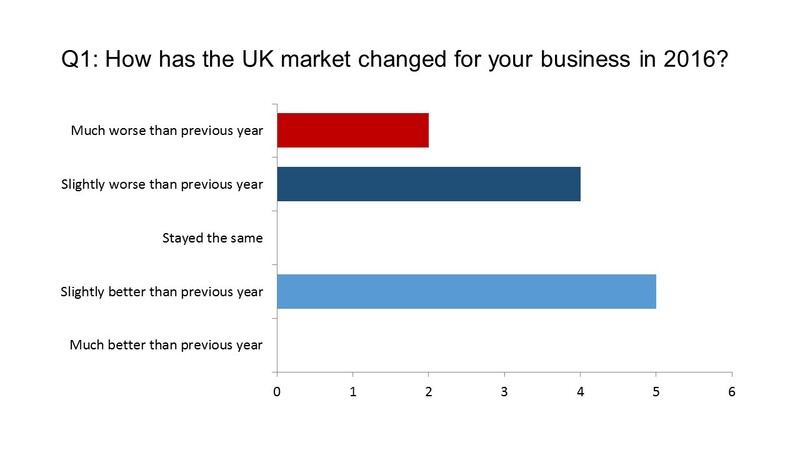 So how did all these macro-trends affect the UK pharmaceutical sector? 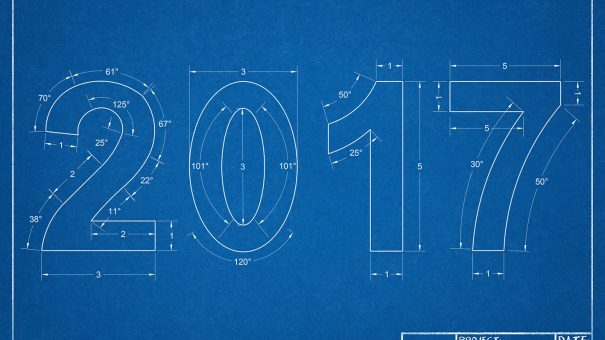 These, along with many market-specific factors will undoubtedly bring great change in 2017 and beyond. We surveyed a small group of 11 UK pharmaceutical industry leaders, either managing directors of UK affiliates, or market access specialists from major pharma companies, and asked them a broad range of questions about the key drivers for their businesses in 2016 and 2017. First, we wanted to gauge sentiment about how (in early December) they viewed 2016 in business terms, and what their forecasts for 2017 were. While the survey sample is small, the senior position of the respondents means the results carry weight. The message is pretty clear: 2016 was a difficult year for the majority, and 2017 is likely to be an even rougher ride. We asked which three UK market-specific factors would negatively impact their businesses in 2017. Nearly all mentioned the overall financial problems of the NHS as a factor. This reflects an unprecedented squeeze on NHS spending, which has had a knock-on effect on medicines spending. The government insists that NHS funding has increased by £10 billion until the end of the 2020-2021 financial year. However parliamentary committees say the real figure is nearer to £4.5 billion – and state that this is far short of what is needed to sustain services. England is falling behind its European counterparts in terms of overall health spending as a proportion of GDP, and also in medicines expenditure. Figures from the ABPI suggest spending on drugs is around 1.0% of GDP, compared to 1.3% in Germany and Italy, and 1.4% in France (with US spending in first place at 2%). Before the Brexit vote, QuintilesIMS had forecast that the UK would be the second-fastest growing market after the US over the next five years, at a compound annual growth rate (CAGR) of 5-8%. However this was based on list prices of drugs, and didn’t take account of rebates and discounts in the market, including those through the PPRS pricing system. The PPRS has kept spending very tightly controlled, with growth capped at 1.8% in 2016 and 2017, rising almost inperceptibly to 1.9% in 2018. 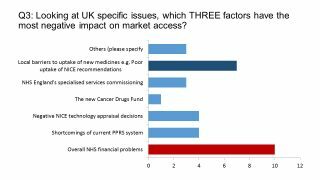 Nevertheless, only two respondents identified ‘shortcomings of the current PPRS system’ in their top three – indicating that it was a lack of funds across the entire NHS which was holding back uptake of new medicines. This is also reflected in the second-most-cited factor, local barriers to uptake of new medicines, including poor uptake of NICE recommendations. In conversation with pharmaphorum, UK pharma leaders made it clear that the fragmented nature of decision-making in England, with power retained at the local level, means that even NICE-approved drugs aren’t guaranteed rapid uptake. For the UK as a whole, Brexit will undoubtedly be the dominant issue for 2017, and this applies equally to the UK pharmaceutical industry. 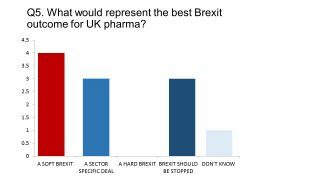 As we revealed last month, the sentiment among our respondents on this issue was not hopeful: most believed that Brexit would cause long-term damage to the UK pharma industry. None believed that Brexit could positively boost UK life sciences. It appears that the anonymity of the survey allowed respondents to give a more truthful response – and a more pessimistic one – than otherwise expressed publicly. On record, most pharma leaders are accentuating the positive – a pragmatic necessity for an industry hoping to stay on side with the government and gain as favourable an ‘industrial strategy’ from government as possible. The government has promised to produce overarching industrial strategies for key sectors in early 2017, including Life Sciences, which will encompass ways to exploit any advantages of Brexit. When asked what they believed the best possible outcome would be, the response was clearly in favour of a so-called Soft Brexit, which would most likely entail remaining part of the single market or customs union, but giving up full EU membership. 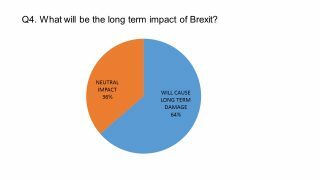 However the longstanding scepticism about Brexit showed through, with three respondents daring to suggest (anonymously) that Brexit should be stopped – a viewpoint that has become marginalised by the government and pro-Brexit UK media. None of our respondents believed the UK should aim for a Hard Brexit – however at the weekend Theresa May hinted that this was the most likely outcome. It is possible to overstate the sector’s pessimism – the overall UK economy has proved surprisingly robust after the shock of the Brexit vote, and many polls across sectors suggest business confidence stabilised in late 2016. However, a clear picture will only emerge once negotiations between the EU and the UK begin this year, and talk of possibilities narrow down into cold, hard realities. The next few questions in our survey turned to the NHS – e.g. 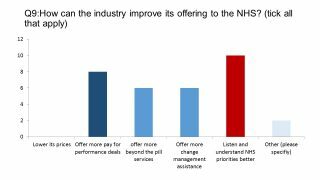 who the industry viewed as the most important players, how it viewed the NHS strategy, and what reasons for optimism there were, if any. Reforms introduced in 2012 led to a fragmentation of decision making in England’s NHS, splitting responsibility between many organisations. 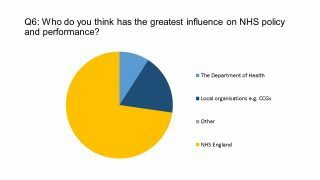 However our survey confirmed that NHS England (NHSE) is now seen as the dominant force in the health service. NHSE is taking a firm grip on budgets and spending, and is continually seeking to extend its influence, including in medicines expenditure. This ‘mission creep’ from NHSE is largely in order to prevent a deterioration in services, but reports of a frontline ‘humanitarian crisis’ have hit the headlines in recent days, as winter demand for services peaks. NHSE is aiming to create a health service that is sustainable in the long term by moving at speed towards integrated care – joining up a system currently fragmented between primary, secondary and social care. One of the key means of achieving this is through the Sustainability and Transformation Plans (STPs), 45 pilot projects across England. These aim to bring together local Clinical Commissioning Groups, hospital trusts and local government to create new plans for joined up care – which is, hopefully, better and more cost effective care as well. However, when we asked our UK pharma leaders if they believed STPs could be successful, most answered no: 10 out of 11 said they were either ‘not confident’ or ‘not at all confident’, with just one respondent saying they were somewhat confident. 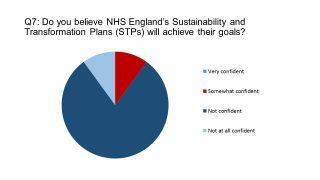 None of our respondents were keen to go on record to outline their lack of optimism on STPs, but the sentiment is probably based on recent experience in the NHS. Local health services are often overloaded with restructuring plans and targets, while being under-resourced in management expertise, funding and time for plans to mature before yet another set of strategic goals is announced. Most stakeholders believe the vision for integrated care is the way forward, but STPs might not get the budgets or time to achieve their goals. 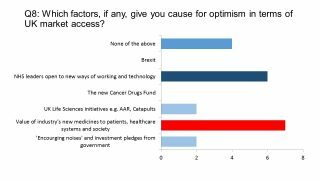 Coming to the last few questions of our survey, and attempting to look at the upsides, we asked our UK pharma leaders what gave them cause for optimism. One of the most encouraging signs, they believed, was the willingness of NHS leaders to introduce new ways of working and technology. However belief in existing strategies, including the much-vaunted Accelerated Access Review (AAR) was low. Not surprisingly, it was their insight and belief in drugs in their own pipelines and across the sector which inspired the greatest hope among the pharma executives. Late 2016 produced some cause for optimism, thanks to a raft of new deals on cancer drugs between NICE and pharma, plus AstraZeneca’s Tagrisso being the first drug accepted into a new ‘managed access’ Cancer Drugs Fund (CDF). Among the stand-out drugs likely to hit the US and European markets in 2017 are Roche’s multiple sclerosis drug Ocrevus and Kite Pharma’s CAR-T cancer therapy KTE-C19, to cite just two examples. Both these specialist drugs have the potential to transform care, but will also come a with a high price attached. Social care and primary care services are both desperately in need of extra cash, however, and NHSE has indicated that any new government funding should go to them first. 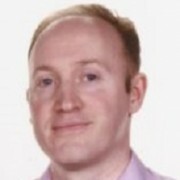 NHSE’s director of specialised commissioning Jonathan Fielden has indicated that specialist care and specialist care drugs will be “at the back of the queue”, far behind these two priority areas. Further to this bad news, among the biggest concerns for UK pharma are changes to the NICE process – the ‘budget impact threshold’ and a new QALY threshold for rare disease drugs. These changes are being driven by NHSE, with the consultation on this ending in a few days’ time. However many in the industry fear it is simply another mechanism for NHSE to control specialist drug spending. The greatest source of conflict between the pharma industry and the NHS, and bodies such as NICE and NHSE in recent years has, of course, been around drug prices. However none of our respondents believed that the industry should make further concessions on prices – and were likely to point to the tight rein on spending already in place via the PPRS and other price control mechanisms. The industry has been criticised for many years for not truly understanding the pressures and priorities of the NHS, instead being focused in isolation on uptake of its products. Our survey shows respondents have taken this on board, with some support for more ‘beyond the pill’ services and direct assistance to the NHS in change management too. There is also, undoubtedly, appetite for more ‘pay-for-performance’ deals aka value-based pricing (VBP). The current PPRS agreement is a barrier to this, but we should expect to see further moves towards new approaches to reimbursement in 2017, as both and the UK government support the idea in principle. The current PPRS deal expires at the end of 2018, and talks on a successor will begin this year. A new system which rewards innovation and creates fair risk-sharing between industry and the NHS will be a key demand from pharma in 2017, and would be central to the promised life sciences industrial strategy. However budgetary control will continue to be the guiding principle for the government. Finally, we felt compelled to ask our UK pharma leaders how they viewed the most seismic event of 2016: Donald Trump’s election to the most powerful political office in the world. 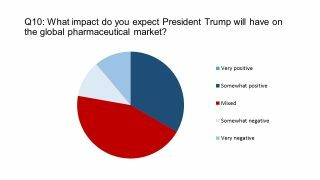 So how might Trump affect the global pharma market? As forecasting has been much maligned in 2016, this may prove to be the most difficult question of the survey – especially as unpredictability is the stock-in-trade of the braggart billionaire. Global pharma leaders had already anticipated a paradigm-shift in US drugs pricing (having bet on Hillary Clinton to win), and movement in the world’s most important pharma market will undoubtedly have consequences for the sector globally. Hold on to your hats in 2017, it’s going to be a bumpy ride. Look out for further insights from our survey, including interviews with UK pharmaceutical industry leaders on the key issues.